Secretary of State Mike Pompeo struck a positive tone when he addressed reporters after his meeting with North Korean official Kim Yong Chol in New York City Thursday. At the same time, a U.S. delegation is in Singapore meeting with North Korean officials in preparation for a planned summit between North Korean leader Kim Jong Un and President Trump. The talks offer a real opportunity for the U.S. and North Korea to enter into "a new era of peace, prosperity, and security," Pompeo said. "Through these series of meetings, I'm confident we're moving in the right direction... It could be nothing short of tragic to let this opportunity go to waste." 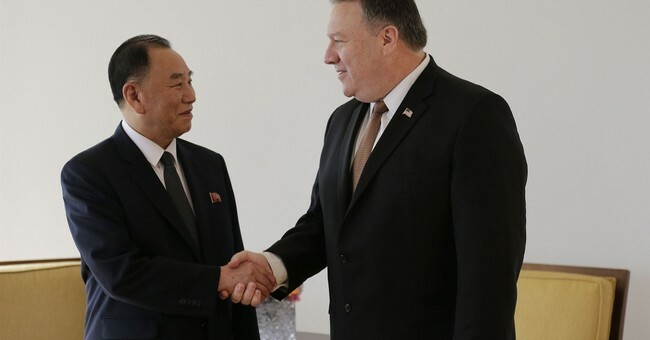 The secretary said that in his meetings with Chol, he was very clear that the U.S.'s objective is to assure "the complete, verifiable and irreversible denuclearization of the Korean Peninsula." "If Kim Jong Un denuclearizes, there is a brighter path for North Korea," he said. "We envision a strong, connected and secure, prosperous North Korea that maintains its cultural heritage, but is integrated into the community of nations." The future can be one of "friendship," not threats. In his meetings, Pompeo detected that the current leadership is prepared to make that "strategic shift." Pompeo said Chol is traveling to Washington Friday with a "personal letter" from Kim Jong Un. Watch the secretary's full remarks below.